The linoleic acid (or allcis-9,12-octadecadienoic acid), to which the chemical formula is C18H32O2 is a 18-carbon diunsaturated carboxylic acid of the omega-6 series. 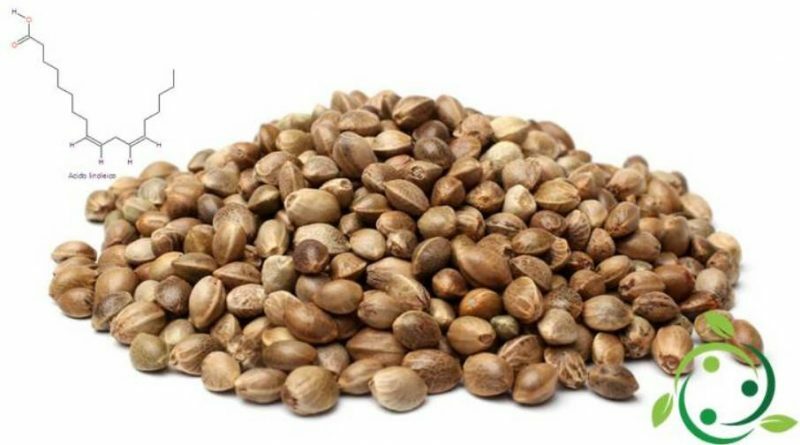 It is a colorless liquid and its melting point is at -5 ° C.
In nature, linoleic acid is found in all vegetable oils but is abundant in some of these, including in particular in cannabis oil, safflower oil, sunflower oil and to a lesser extent in corn oil, soybean oil and other plants. In addition to the vegetable world, it is present in some fats of animal origin. Linoleic acid is one of the chemical precursors that the body uses to create endocannabinoids. Furthermore, in the human body, linoleic acid is the bio precursor of the synthesis of arachidonic acid, which is also an essential fatty acid because its endogenous biosynthesis is not able to satisfy the body’s needs. In addition, the linoleic acid is converted into arachidonic acid and prostaglandins. This acid is nowadays studied above all in the role of prevention or in the treatment of various diseases. Among other roles, some studies would indicate it as useful in lowering cholesterolemia, acting on intestinal absorption of cholesterol. According to the sources LARN (Recommended levels of intake of nutrients for the Italian population), the intake of essential fatty acids omega 6 must constitute 2% of total kilocalories; moreover, the ratio between omega 6 and omega 3 should be at least 6: 1, or even better 4: 1; however, it has been estimated that in the Italian diet the ratio between omega 6 and omega 3 is between 10: 1 and 13: 1. An excess instead of taking linoleic acid, to the detriment of alpha linolenic acid could increase the risk for diseases of inflammatory / autoimmune origin, such as atherosclerosis, cardiovascular disease, rheumatoid arthritis, osteoporosis, mood disorders, cancer, diabetes and obesity. In addition, the intake of high doses of linoleic acid (> 20% of total calories), in the short term can cause important metabolic and functional damage: formation of toxic lipoperoxides, which are extremely harmful molecules for the liver, especially in the absence of adequate levels of antioxidants and alterations of immune function.